It's a timely statement of Fordham's value as a football school. The school has dedicated support and dollars into their athletics, and as it is, Fordham football has rewarded their trustees and fans with some fine results along the way. 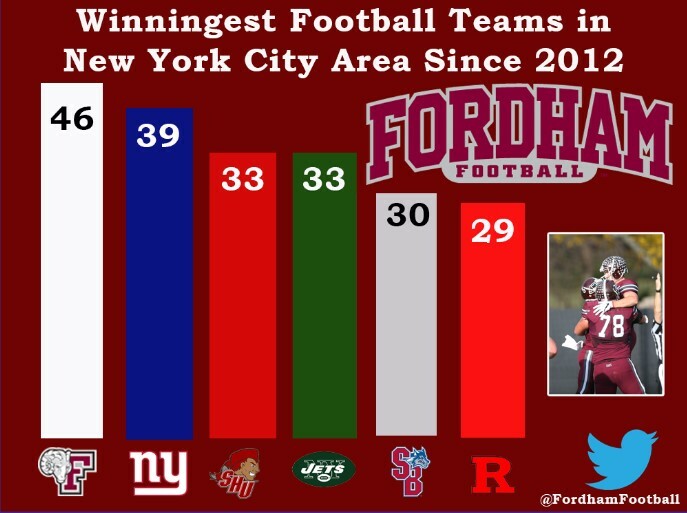 There have been far less deserving schools in the greater NY/NJ region that have parlayed their proximity to the city into better situations, but none that have done more on the gridiron than Fordham. Fordham's another one of those teams that I find myself rooting for when they aren't lining up against Army. I would love to see Fordham move up and play in the FBS. With their current trajectory I could see a place for them in a few of the eastern or midwestern leagues, which, obviously would have a lot more to do with their geographical location than anything else. If Fordham stays at FCS level and if Army keeps up with their two FCS foes per year, I could only hope they make an attempt at keeping this regular, competitive, regional rival on the slate. Fordham has done everything they could to become a competitive FCS team. They don't need Army in order to achieve legitimacy at the FCS level. It's all on Army to invest in this game. Though the history isn't there yet for this matchup, with Fordham's rising football profile I think an extended series could work well for both teams and manifest into a decent rivalry. Army could find value in a bus trip 2- home & 1-away scheduling arrangement or a shared Yankee stadium experience. The scheduling possibilities are many, and presently (for some undetermined limited time) the Cadets and Rams are playing for the title of top college squad in New York state, not just NYC. I mean just look at this graphic from the game notes. How can you not love what the Rams athletic department is doing? I will take Army some time to climb that list, but they can schedule Fordham and play for the distinction of best in New York rather than do things like hunt this albatross. 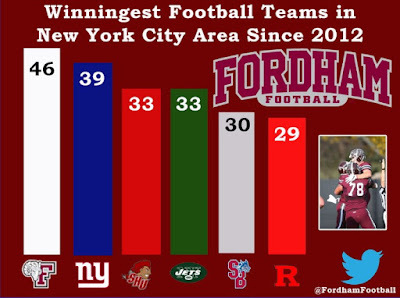 Fordham, the winningest NYC team since 2012, have gone 2-3 in that time frame against FBS opponents.